Onkyo and Cerwin-Vega! are proud to announce the Chase Rice “Ready Set Roll” Contest starting today and running through December 15th. 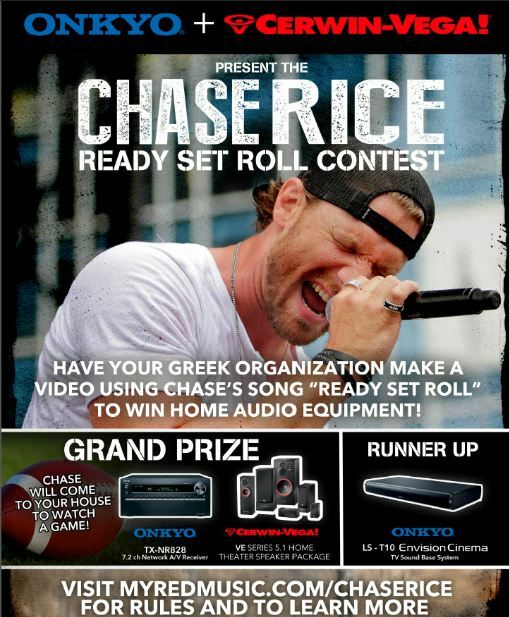 The contest invites all active Greek organizations and chapters to submit YouTube videos utilizing country artist Chase Rice’s current hit single “Ready Set Roll” in a creative and interesting way. The top five most-viewed videos on YouTube will be seen and reviewed by Rice, who will ultimately crown the winning submission. The winning chapter will be awarded a visit from Chase Rice at their house to watch a sporting event in addition to an Onkyo TX-NR828 7.2 Ch. Network A/V Receiver and a Cerwin-Vega VE Series 5.1 Home Theater Speaker Package. The runner-up chapter will receive an Onkyo LS-T10 EnvisionCinema TV Sound Base System. Visit www.myredmusic.com/chaserice for official rules and to learn more about the Chase Rice “Ready Set Roll” Contest. Since 1946 Onkyo has been passionately committed to developing audio products that deliver uncommon performance, quality and value. Bundling proprietary technologies and innovations with other sound-enhancing exclusives, Onkyo continues to created award winning products that are lauded by many of the industry leading audio publications. The company’s philosophy is to deliver products that are superbly designed and built to a consistently outstanding standard of excellence. The results can be seen in the obviously high quality of any Onkyo-manufactured product, even before it is turned on. 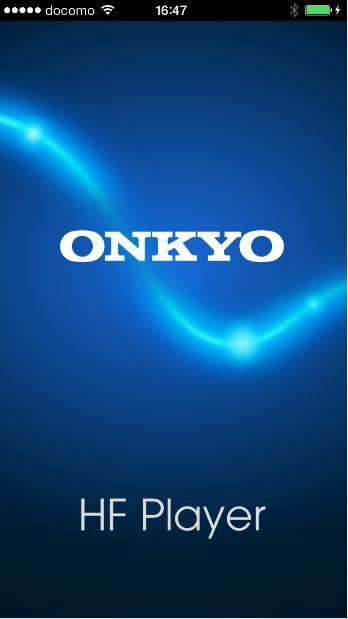 Visit Onkyo’s website at www.onkyousa.com. Follow Onkyo USA at www.facebook.com/OnkyoUSA. A member of the Stanton Group of companies, Cerwin-Vega!, Inc. is a leader in the design, manufacture, and distribution of loudspeakers for the home and professional audio markets.Designed in the pursuit of dynamic, accurate sound reproduction since 1954, Cerwin-Vega! products are distributed throughout the world via a network of distributors and dealers in more than 75 countries. For additional information on all Cerwin-Vega! products, please visit us online at www.cerwin-vega.com. Within a few short years of moving to Nashville, Tenn.; country music artist Chase Rice has already built a loyal fan base across the country through his energetic live shows and gained the attention of industry professionals with his edgy, eclectic sound. Rice first made waves as a co-writer on Florida George Line’s massive 2012 crossover hit “Cruise,” and his star continues to rise with the chart-topping success of his new digital EP Ready Set Roll and single of the same name. A physical album will be released November 26, 2013 on Rice’s own Dack Janiel’s label in partnership with T8 Records. For more information, please visit http://chaserice.com. Users of Apple mobile devices can now enjoy award-winning Onkyo headphone sound with the convenience of inline controls and mic to make on-the-fly playback adjustments and phone calls easy. The ES-CTI300 on-ear and IE-CTI300 in-ear headphones retain the same brilliant design and specification as the existing four-model range but add a detachable oxygen-free 6N copper cable with iOS-Certified controls. Two versions of the on-ear type will be available. The ES-CTI300(SS) sports a striking silver finish with premium leatherette earpads while the ES-CTI300(BS) features a black finish with matching earpads. All CTI300 model headphones come with a silver (transparent) tangle-resistant cable. The slim three-button cable control offers play/pause, track selection, call accept/reject, and volume functionality and includes a sensitive microphone for clean and clear communication. It’s compatible with almost all current and legacy iPod, iPhone, and iPad models. When it came to designing its new headphone line, Onkyo invested almost 70 years’ engineering experience into translating its signature sound into a portable format, while attempting to replicate the look and feel of its reference hi-fi components. With liberal use of aluminum and clean, stylish lines, both the on-ear and in-ear models successfully introduce high-quality sound to products that are beautifully finished and comfortable to wear. At the heart of the ES-CTI300 on-ear headphones are two 40 mm titanium drivers backed by high-capacity bass chambers encased in lightweight, non-resonant aluminum ear-cups. Combined with the super-conductive 6N cable, a full, pure, and highly detailed sound is produced. Bass response is satisfyingly punchy with the brilliantly clear mid-range sure to win the heart of discerning hi-fi enthusiasts. The IE-CTI300 headphones, meanwhile, use a wide-range 14.3 mm dynamic driver and aluminum/ABS hybrid enclosures to create an engaging and musical performance. Vocals and other mid-range instruments are given plenty of space to breathe. Neutral, but not without personality, these headphones are very light and comfortable to wear and make an ideal partner for iPhone, iPod, and iPad. With a total of three main cable options now available (including flat tangle-free elastomer, one-piece 6N copper, and 6N copper with inline control), Onkyo has a portable sound solution for anyone seeking an authentic hi-fi experience on the go. The ES-CTI200 and IE-CTI300 will both be available in December and have suggested retail prices of $199 and $149 respectively. Onkyo also recently announced an innovative, free HF Player app that enables playback of high-resolution audio files while granting users unprecedented control over how their music sounds. The free, full-featured audio player app features an intuitive interface that includes album artwork display, playback controls, and an organizational structure that will be familiar to any iOS user. Once the app has been pointed to the device’s music library via a synch with an iTunes®-equipped computer (an auto synch function is included), the user can start exploring the benefits of the phase-linear FIR equalizer, which offers 16,384 discrete bands of equalization with zero loss in audio quality. The user simply shapes their desired frequency curve with a finger on the touchscreen to manipulate bass, mid-bass, mid-range, and treble response. Presets may be created to suit a particular musical genre, artist, album, or pair of headphones and can be saved, swapped, and loaded in moments. Since 1946, Onkyo has been passionately committed to developing audio products that deliver uncommon performance, quality and value. Bundling proprietary technologies and innovations with other sound-enhancing exclusives, Onkyo continues to create award winning products that are lauded by many of the industry leading audio publications. The company’s philosophy is to deliver products that are superbly designed and built to a consistently outstanding standard of excellence. The results can be seen in the obviously high quality of any Onkyo-manufactured product, even before it is turned on. Onkyo is a trailblazing force in the home entertainment industry, anticipating market trends with intelligent, user-focused products. This new release joins a stable of acclaimed audio and A/V components, and will introduce more music lovers to the iconic Onkyo sound. The self-titled, sophomore album by charismatic rock trio Icon For Hire was released last week on 10/15, and makes a big impact on this week’s Billboard charts. Published today, the latest listings show Icon For Hire at #11 on the Top Independent Albums chart, #19 on Top Rock Albums, and at #65 on the overall Billboard 200. These are high-water marks for Icon For Hire on all three charts. The release of Icon For Hire was preceded by a successful tour, which found the band performing acoustically and electrically. In addition, “An Evening With Icon For Hire” featured a fashion show with designs from the Custom Catastrophes line, run by Icon For Hire‘s frontwoman, Ariel. The stylish Ariel also recently helped launch REL TV, a podcast that was featured on iTunes along with the Icon For Hire album. On the show, geared towards the younger female demo, Ariel brings her inspirational how-tos and motivating ideas to help you DIY (Do It Yourself) in every area of your life. Icon For Hire is back on the road and touring through the end of November. Check out the dates below. About Icon For Hire: Icon For Hire‘s debut album, Scripted, marked a milestone in Tooth & Nail Records history as their highest charting debut album. The album debuted on the Billboard 200 Album chart, peaked at # 4 on the iTunes Rock chart, and charted at # 19 overall. Their videos for “Make A Move and “Get Well” have received over 6 million views on YouTube. In a move that could revolutionize how iOS users enjoy music on headphones and other compatible hi-fi systems, Onkyo-the world leader in home theater, hi-fi, and personal audio components-has announced an innovative HF Player app that enables playback of high-resolution audio files while granting users unprecedented control over how their music sounds. The free, full-featured audio player app features an intuitive interface that includes album artwork display, playback controls, and an organizational structure that will be familiar to any iOS user. Once the app has been pointed to the device’s music library via a synch with an iTunes-equipped computer (an auto synch function is included), the user can start exploring the benefits of the phase-linear FIR equalizer, which offers 16,384 discrete bands of equalization with zero loss in audio quality. The user simply shapes their desired frequency curve with a finger on the touchscreen to manipulate bass, mid-bass, mid-range, and treble response. Presets may be created to suit a particular musical genre, artist, album, or pair of headphones and can be saved, swapped, and loaded in moments. Onkyo also enlisted a team of respected musicians to personally design EQ presets optimized specifically for Onkyo in-ear and on-ear headphones. The team comprises Chris Traynor (Helmet, Bush), Scott Ian (Anthrax), Jim Ward (Sparta, At the Drive-in), Leo Nocentelli (The Meters), Tim Lopez (Plain White T’s) and Steven McMorran (Satellite), along with groups Midi Matilda, Buckcherry, and Strange Talk. The Presets from these artists are included in the app. Additional functionality includes an automatic upsampling function (from 44.1 kHz to 48 kHz) and selectable track crossfading. Onkyo hopes the friendly interface and audio flexibility will turn casual listeners, who may have only just begun to rediscover their favorite music with a pair of quality headphones, into budding hi-fi enthusiasts. As their confidence grows, so too does HF Player. Users seeking the ultimate in high-resolution audio performance can make an in-app HF Player Pack purchase (US$9.99) to enable FLAC, DSD, WAV, and AIFF playback of up to 192 kHz with 24-bit sampling (these files are loaded via a simple drag-and-drop operation on an iTunes-equipped PC prior to synchronization). This in-app purchase also enables selectable upsampling from 44.1 kHz to a possible 192 kHz, and an HD phase-linear equalizer with an incredible 20,000 bands of adjustment in 64-bit mode. As well as the flexibility and control offered by the precision FIR equalizer, HF Player introduces SACD (Super Audio CD) and better-than-CD audio quality into the portable domain. Paired with a set of quality headphones, such as Onkyo‘s award-winning ES-HF300 on-ear or IE-HF300 in-ear models, HF Player lets audiophiles enjoy premier high-resolution sound while they’re on the road. The release of the HF Player app demonstrates Onkyo‘s ongoing commitment to portable hi-fi. 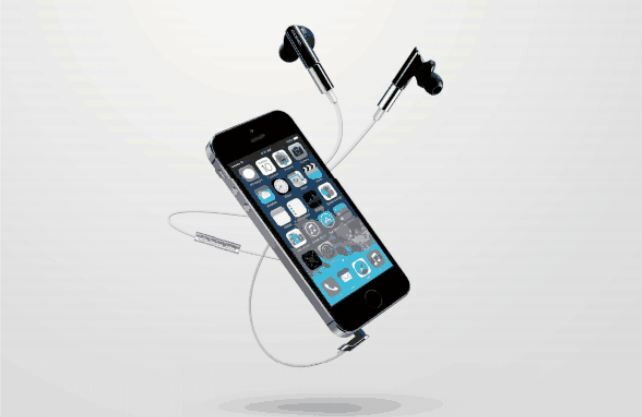 Complementing the company’s growing range of premium on-ear and in-ear headphones-which have gathered significant momentum both critically and commercially since their release-this new app will allow listeners to discover how truly great their personal audio setup can sound. * Note: DSD-IFF and DSF formats are converted to PCM before playback. Playback of high-resolution files places high demands on CPU and battery resources. For optimal playback results, Onkyo recommends closing other applications and placing your device on Airplane Mode. The self-titled, sophomore album by charismatic rock trio Icon For Hire arrives in stores and online today. 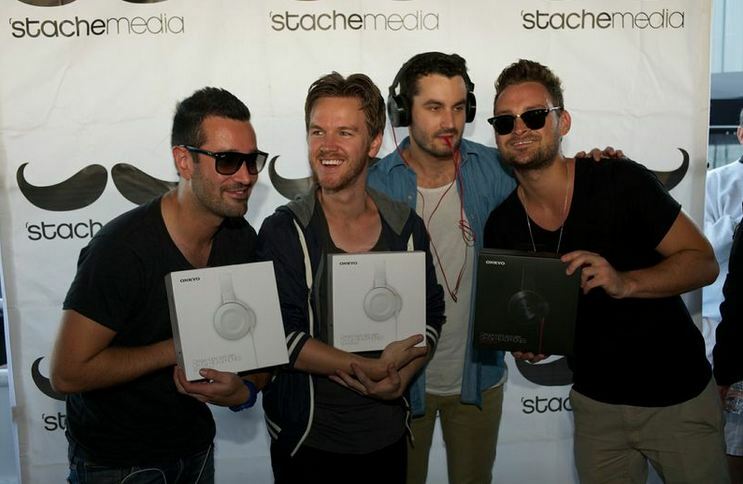 The album has already been preceded by a successful tour, which found the band performing acoustically and electrically. In addition, “An Evening With Icon For Hire” featured a fashion show featuring designs from the Custom Catastrophes line, run by Icon For Hire‘s frontwoman, Ariel. Recently, more Icon For Hire tour dates were announced, running through late November. Hailing from sunny South Florida, Victory Records’ Neurotic November is getting set to release their debut studio album, Annunaki.The aggressively musical quintet recently premiered the lyric video to one of Annunaki‘s tracks, “Nonchalant” on Substream Music Press. Comprised of vocalist Dirty, bassist Bear, Yoshii and Nig on guitar, and Paiste on drums, the members of Neurotic November come from all walks of life and value free-thinking and open-mindedness above all else. Their backflips, unparalleled conviction, and obvious passion work together to create an unforgettable live experience, and their professionalism breeds spotless musicianship. 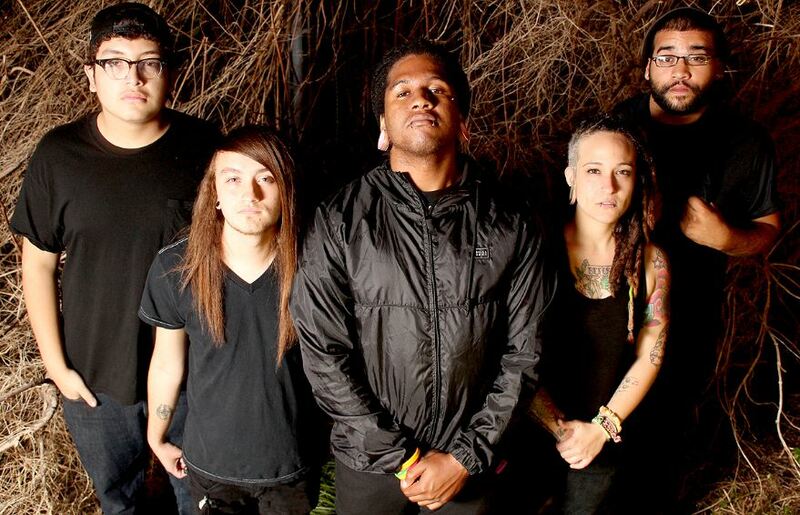 Officially beginning their journey in 2009, Neurotic November began humbly with Dirty (vocals) posting an ad inquiring about a bassist for his band that had immense potential. Almost immediately his search was fulfilled with the addition of Bear, female bassist who quickly trademarked her aggressive playing style and tough-guy attitude. These two musicians with a dream suffered through multiple line-up changes in order to successfully release their EP Passive May in 2012, which showcased the never-ending energy and exhilarating song structures that began their steady climb towards the top of the metal scene. Charismatic rock trio Icon For Hire is having a busy autumn, for sure. Having completed their highly anticipated second album, due 10/15, they’ve announced preorders for the self-titled effort on iTunes and on the website of their label, Tooth And Nail. They’re also just about to start their latest tour. Called “An Evening With Icon For Hire,” the shows will include acoustic and electric performances, a Q&A with the group, and a fashion show featuring designs from the Custom Catastrophes line, started and run by Icon For Hire‘s frontwoman, Ariel.